A friend of Aline’s, I’ll call her Martha, called a few weeks ago and wanted to take us out to lunch. This was during the Cowboy Poetry. We met in town with her and a couple of her friends. We got to talking about cowboying and brandings, and the other people were interested in how we branded on the wagons. I explained that the Circle A was a head and heel outfit and the Ellison Ranching Company was heels only. For some reason Stanley Ellison didn’t want those bigger calves stretched out. We would talk about other things, but the conversation would eventually swing back to branding calves--on the smaller ranches, and on the big ones, which Martha’s friends had never been on. They told me they were not cowboys but they would go to brandings and help on the ground. They called themselves “calf wrestlers” and they really enjoyed doing it, although they would sometimes get banged up and it could turn into a lot of work. They wanted to know how we went about wrestling calves on the big outfits, and particularly, how we did it out of a rodear with only two guys on the ground. They had all kinds of questions on how to handle calves with only two guys. “It’s easy,” I said, “it’s the guy on the horse that makes it work.” Actually, I had never heard the term “wrastling” when I was in the life. It was more like--you work the ground, or you cut, or you brand ‘em. Not being cowboys, they weren’t quite sure as to what I was saying. These two were good guys, and they were really interested in the rodear fashion of branding. We had a lengthy discussion about the whole thing--I’m glad I quit drinking, as if we had been in a bar we would have been there ‘til the sun rose the next morning. Aline and Martha were getting a kick out of the whole thing, and then they brought up the idea of me writing it down. “It’s always easy when you do it in town, and it’s even done better when you’re in the bar,” I answered. Martha said she has read a couple of my stories, and if I could write about the rodears the way I talked about them in the restaurant, then that might surely make a good story. She let me know that it would be appreciated as the wagons were becoming a thing of the past. We parted company, and on the way home Aline told me that it would be a good idea to write it down. After all, it might get a really good discussion going on the Irreverent Buckaroo. And so, Martha, it’s weeks later, and it looks like you’ll get your wish. I made a haul to Tooele, UT, but I’m home now, and it is 3:30 AM on a Saturday. I can’t sleep, my fingers are tapping on the counter, and my left leg is shaking. I just made a pot of coffee, and I’ll soon eat a banana with that coffee. I can feel one of those “moods” coming on. I thought I had finally gotten out of these marathon writing sessions but it looks like I’m going into one now. I’m not a journalist, and this is not easy for me. Who knows how many hours I’ll be here. I have things to do today, but getting them done is not looking good at this time. Enough of that whining. So, OK, Martha, let’s go “rodash” some cattle. We’ll go back forty years to the Spanish Ranch wagon and ride and rope. Let’s ride, sister, let’s really ride…..
You know how when you go to a branding there are lots of people there? A pickup will be loaded with the irons, the medicine, wood or propane gas, food and drinks. Another pickup or two will take those that are not horseback to the site. The neighbors are there to rope, people from town bring their horses so they can rope, and there are also folks that show up just so they can help. They don’t care what they do, they just want to get in on the action. Ranchers have a tendency to be a little picky on who does the cutting with the knife and who’s applying the iron as they want that work to be done right. The vaccinating will quite often go to a teenage girl, and the young guys get to do the “wrastling”. And wrestle them they do. Not just wrestle those calves, but attack them as well. Cowboys, how many times have you been dragging a calf in and when you’re about thirty feet away from the fire you look back and see some young buck jump on that calf and now your horse is dragging both calf and “wrastler” in? Or worse yet, a green roper will stop and turn his horse around as soon as that calf gets attacked. Now you got a calf thirty feet from the fire. Doesn’t make much sense does it? And he’s right. All of us go to a branding to have fun. And I can’t blame those young bucks for what they do, right or wrong. The first thing they want to do is impress the rancher with what hard workers they are so he’ll invite them back again. Then they have to show each other how macho they are. And then, of course, there are the girls. What would a branding be if a young man couldn’t show off his strength and talents to the girls? We’ll usually meet at the ranch and be horseback by about 7:00 AM. If we’re gathering a herd outside the ranch, then we’ll trailer our horses to the meeting spot. For the most part, in this country, they try to keep the number of calves to be branded to a reasonable number. For instance, brand one hundred head in the morning, have a few drinks with a big lunch, and then hit another hundred head in the afternoon. During each branding they’ll take a break, visit a little, and have something cold to drink. By keeping the numbers down there will be less chance of leppying a calf. If we’re outside we’ll finish branding, then have a nice lunch, and then trailer our horses home. Brandings get the work done, and at the same time they can be a social event for all those involved. Nowadays, for me, not only are the brandings still fun, but it’s good to get out and see folks that I haven’t seen in awhile. My legs are pretty much shot now so they don’t expect too much from me when I’m on the ground. Over the past several years I haven’t been to very many brandings, and so my roping has gotten somewhat rusty. Will I ever get back to that level of my youth? Probably not; I’m not admitting defeat, I’m just facing the facts. My hand speed is gone, and my hand and eye coordination is not what it once was. I’m tuning up though, as I want to get out there more this spring. And what if I don’t get back to that level? So what--Aline says she’ll love me after I’ve roped my last calf; as a matter of fact, she says she’ll still love me after the last horse has been saddled. Ain’t that sweet? All that sounds pretty good doesn’t it? Lots of roping, lots of fun and laughter, and after the branding most of us would meet up in the bar. And make no mistake about it, it is good. But is that the way it was in the school I came from? No. Forty years ago right now I was working for wages on the Spanish Ranch in northern Elko County, and things were a little different. It is now 5:45 AM on March 10, 2012. At this exact time in 1972 I would be up and dressed and waiting for the bell to ring for breakfast. I had started ten head of five and six year old broncos the month before, and who knows, maybe I rode one of them on this day. Probably not though, as this time of year we would have been really busy and those broncos just wouldn’t be able to take those kinds of days. The snow may or may not have still been on the feed ground meadows. It didn’t make any difference though what the weather or the conditions were. We had to get 1,000 heavy cows worked out so we could brand those calves while we were still on the ranch, and then we had to get another 3,000 not so heavy cows ready, as we wanted to start turning out a thousand at a time by the middle of April. We would try to keep the branding numbers down to about 100 to 125. Leppying calves was a very big concern for us; there ain’t no profit in dead calves. Those cattle would be driven down the South Fork of the Owyhee River for about 15 miles and then shoved over the hills toward Four Mile, the Winters, and then on out onto the Owyhee Desert. There were about 500 Door Key cattle that raised registered bull calves and 1,000 yearling steers that would be turned out on the Andre Allotment. The wagon would go out around the 20th of May, and we would brand out there. We’ll brand as many of those calves from the 3,000 head as we could and then finish branding them in the fall on the ranch. The last job of the wagon would be to gather the Andre Allotment, sort those steers out, and then brand those 500 calves. Sometime in April we’ll run the cavvy in and trade our winter horses in for our spring wagon horses. Now, on the ranch, I’m riding five steady horses and a bronco or two mixed in. With the wagon I’ll get six or seven horses with a young horse or two thrown in for good measure. The Ellison Ranching Company had seven ranches at that time. The headquarters was the Spanish Ranch, then heading south there were Squaw Valley, the Upper Clovers, the Lower Clovers, White House and then on down south of Battle Mountain were Fish Creek and Cottonwood. The two Clover ranches and Fish Creek and Cottonwood were hay ranches. Fish Creek had a feed lot on it and finished cattle were shipped out of there. Stanley Ellison was the man, and Bill Kane was the cow boss on the Spanish Ranch. Kane had married Marie, Stanley’s third daughter and at that time they had only the twin girls. Kane wasn’t the boss because he was Stanley’s son-in-law. Oh no, that’s not the way that outfit worked. Kane was the boss because he was good, damn good. And he could be tough, damn tough. Ellison wasn’t in the ranching business for a tax write-off. They were in it for the profit. Therefore, we were expected to do things the right way. If not, then it was bye, bye, cowboy. With the company being in the business for the money, and Kane’s toughness and insistence that things would get done the right way come hell or high water, there was a large turnover of cowboys. I say this for a fact; I know, for I was there. The Spanish Ranch was cold, very cold. It was cold outside, and it was cold inside; my water jug would freeze in the bunkhouse. I ain’t saying it gets as much snow as Montana, or the wind of Wyoming, but 10” of snow and 30 below is plenty tough enough for me. Martha, the people in Elko County ain’t too smart. One time it was 102 in June. I remarked on how hot it was, and there was a guy from southern Arizona that told me that we didn’t know what hot was. Another time it was about 22 below, and I made mention on how cold it was. Well, but wouldn’t you know it, there was a man from North Dakota, and he said we didn’t know what cold was. See what I mean about us Elko County residents, we don’t know when it’s hot and we don’t know when it’s cold. Now ya ask me, that ain’t being too bright! On my second tour of the Spanish Ranch I was calving heifers at night. I would eat breakfast, take a little nap, drive a pickup down the River Ranch lane, and help the cowboys brand as we were short of ropers right then. I don’t remember if I had the irons and vaccines or if the cowboys carried them on their horses. Sometimes when we branded in the Airport Field the wives might bring a pickup, but once again, I don’t remember how the irons and vaccines got there. There was a meadow, I can’t remember the name now, that we couldn’t get a pickup to as the water from the South Fork would be too high. Sometimes we would have to rope those calves by the head if the water was taking them downstream. Ever roped a calf in water? It’s easy, he’s got his head sticking up as high as he can get it. Those are the only times I ever saw a pickup around a branding, and like I say, I don’t remember how the irons and medicines got there. I know this for a fact: that pickup never had any propane in it. The irons were heated in sagebrush fires that the cowboys gathered up by hand. Some other things that pickup never hauled were food or water. On the ranch or out in the brush, if you were thirsty, you laid down on your belly and drank from a creek. NOTE 1: Terry Riggs and I were talking about this a year or two ago. He commented on how we never drank any water and how that would be really hard on us if we were to try it today. He opined that since we didn’t have any water then, we didn’t think about it and so we just kept moving on. If there was water, you got off your horse and took a drink; if there wasn’t any water you stayed on your horse and kept on riding. That’s all I know. I’m going to say something here that I probably should not bring up. However, it is something that happened, and I guess it’s a reflection from the school that I came from. Years later, I was going to take Aline on her first ride into the Ruby Mountains. She was all eager to go, and in her enthusiasm she asked if we had any saddlebags to carry our lunches and what about canteens for water. I completely blew up. She was shocked. It wasn’t her fault; she had only asked a simple question. I felt bad after I reacted that way, and to tell the truth, I feel bad about it this many years later. And to this day, she still jabs me about it. The reason I even write this is because when I’m in these marathon writing “moods” things just pop into my head. These writings are based on facts, and I feel that the bad must also come out with the good. Just saying, that’s all, and that’s the end of NOTE 1. When we were branding on the ranch, we worked it with whatever number of cowboys we had and how good of ropers they were. Say we had six guys and two of them were good ropers. At first we might have the good ropers going and the other four on the ground. After the first half was branded Kane might add one of the newer guys with the ropers as the calves were wising up and getting harder to catch. I guess what I’m trying to say here is that there was no set pattern on the ranch. Kane did what had to be done. We had to get the work done but at the same time the newer and younger guys had to produce. However, out in the brush it would be a different story. No matter the number of cowboys, it was two on the ground and two roping. Kane usually had one good roper and one newer roper together. That way there is a calf coming in and at the same time the younger guy is getting more experience. Ya gotta admit, he had a valid point. Kane’s school was the 25 Ranch with John and Tom Marvel. Lots of good cowboys came off the 25 Ranch, and Kane had been around good cowboys all his life. As he said, if a guy said he was a cowboy, then Kane expected him to be a cowboy. Sad, but true, the truth of the matter was the times they were a-changing. And it’s too bad. I saw some young kids that came in that were good kids and had a lot of potential; they just weren’t quite ready for what Kane expected from them. The wagon went out around the 20th of May. The three times I went with it, we always left on a Sunday morning. Ya see, we were supposed to get Sunday afternoons off. No sense in pulling the wagon out on a Monday morning with a bunch of hung-over cowboys. The whole purpose of a wagon is to be where the cattle are and eliminate that forty mile drive to the herd. Our first camp was Four Mile. We spent 4 or 5 days there, and then we pulled out. 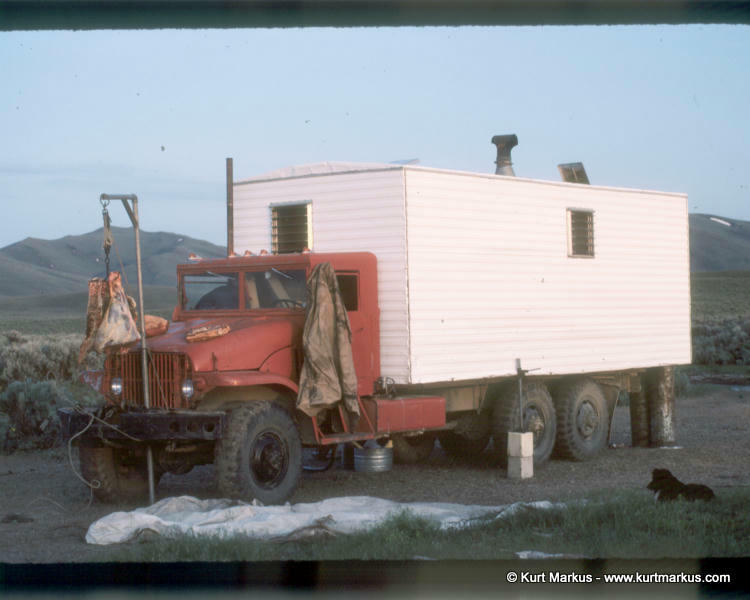 Whenever the wagon moved, I would pack salt to the high country and meet up with the boys at the next camp. Sometimes we stayed at the Winters. For the life of me, I can’t remember what we did with the cavvy when we stayed at the Winters. The Winters was part of the Allied, and I know we didn’t put those horses in those crested wheat fields. I can remember shoeing a horse one afternoon in that old pole barn at the Winters, and I can remember Kane and his uncle, also named Bill, meeting with me in my tent one night after dark at the Winters. So where did we put those horses? I’ll have to ask somebody one of these days. Kane always carried the vaccine guns and the medicines. He had a canvas that he would wrap them up in and he would tie them behind his cantle. We carried four Pitchfork irons with us. That was the company brand. The brand was on the left hip with the three tines pointing to the cow’s head, two ear marks, and a neck wattle. Each iron came in two pieces. In the middle of the handle were male and female threads so we could screw the pieces together and make one long handled iron. I would unscrew my two irons and put the four pieces in a 25 pound burlap bag that was originally used for sheep salt. You don’t see burlap bags anymore, especially ones for 25 pounds of salt. I would then tie the bag behind my cantle. It was kind of bulky but it wasn’t too bad as long as I didn’t have to tie a jacket or a slicker on top of it. If that was the case, the jacket or slicker would hit me in the lower back as we were trotting along. If it looked like rain, then, of course, I would take my slicker. However, very, very seldom did I ever pack my lined Levi jacket. Even in the months of June and July the early mornings would be cool enough to justify wearing a light jacket. I would wear it while I was saddling my horse, but I would take it off just before I got on as we would hit a trot and within minutes I would be too warm to want a jacket. Once the sun came up it would get hot, and then I would be stuck with the jacket tied on top of the irons for the rest of the day. Hope that all makes sense to you. Kane always did the horse roping. I see in the books and magazines where they say the jigger boss (lead off man) ropes the cowboys’ horses while the cow boss does--I don’t know, they never talked about what he does when the cowboys were catching horses. The last year I was there I was the lead off man, but the only time I ever roped the horses was when Kane wasn’t there, which was not very often. Kane was a hard working guy and there was no way he was going to stand around while someone else roped horses out of his cavvy. He was a lot stronger than me, and he could work me into the ground. Not just me, but everybody else too. He loved to work, and he was fast; I really had to push it to keep up with him. Here’s a good example: My first year on the wagon he and I were working the ground. He had the knife and the vaccine gun, and I had the irons and the fire. When I asked him if that was the old time tradition of doing things, he replied, “No, before I was boss the brander did the vaccinating too. The reason I do it this way is most of the cowboys can’t keep up with me so I just do it myself to keep things rolling along.” Now don’t think for a minute that he did that out of the kindness of his heart. No, he did it ‘cause the others were too slow in his book. From that day on I took the gun, the irons, and the fire. I mean, we have to keep up with the old timers’ tradition, right? When I was the lead off man, the cowboys would rather work the ground with Kane than me, as I wouldn’t do the vaccinating for them like he did. I didn’t mind helping a guy, but I wasn’t going to do his work for him. And Kane had no problem with that. There was little prestige in being Kane’s lead off man. Personal pride and, of course, I was paid more money. One hundred dollars a month more to be exact. However, Kane (and Brian Morris on the Circle A) felt that if you made more money, then you should do more work. He was the boss so he expected himself to do the most work. Since I was the number two man, well, you can guess what he expected from me. If you were wondering why I was packing salt and not moving the cavvy with the wagon, which was easy and I loved moving those horses, now you know. You’ve heard where the jigger boss is the first one to be dropped off on a circle and that way when the circle is closed it is the jigger and the cow boss meeting up together? And quite often that is the way it goes. However, if I was riding a young horse or say, the middle of the group would have lots of cattle and going up a hard canyon, well, that’s where I would be. And sometimes if Kane had a big area on his side he might take me with him. So there you have the two guys that know the country the best riding side by side. Now when I say side by side, that means we might be 1/4 to 1/2 of a mile apart and on any given moment one of us might go left or right. 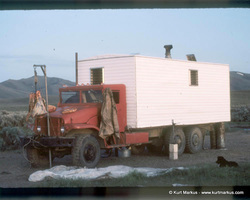 The wagon would then move to Dry Creek, which is the furthest camp out and borders on the Owyhee Desert. Just a few miles to the west runs the Circle A fence. All the big boys meet out on that desert: Ellison Ranching Company, Nevada Garvey, Allied Land and Livestock, and the Petan. If those names aren’t ringing a bell with you let me see if I can help you out: The Spanish Ranch, Squaw Valley, the Circle A, IL Ranch, and the YP. How’s that? Dry Creek is off the beaten path; it’s easy to miss. And if you should be there, you would probably never guess it to be a buckaroo camp. There ain’t nothing there. There’s a wrangle field, I don’t know, maybe three or four hundred acres. There’s a high ridge on one side, and the rest is flat. I thought that ridge would be a good place to be buried. You wouldn’t be looking east, you’d be facing west into the oncoming storms and the Owyhee Desert. But it’s quiet out there. No one to bother you. There’s some water on that north end, and that is where the cavvy usually stayed. Kind of in the middle is a wire corral. It’s been so long since I’ve been there I can’t remember if the gate is wire or wood. There’s a little water near the corral, and that is where we parked the wagon. The first thing I would do when I got there was to get a shovel, dig out a water hole, and make a small dam. That way the cook could dipper out water with a pan and fill his water bucket. The best thing to do was to put a small copper pipe below the water level of the dam as there would be dust and what have you floating on top of the water. The water would flow out of that pipe and presto--you have running water. Of course, if the cavvy came munching grass down through there, everything would get wiped out. They call it Dry Creek for a good reason. Not only was it a Spanish Ranch camp but it was also used by the old guys when they were running horses way back when for the military. When I was there the old tin cans were still tied to the wire fence strands. Don’t quote me on this, as it’s been forty years since the story was told to me, but as I remember they would come out of that field on the fly with those mustangs and push them to Button Point (there’s a NDOT rest area there on I-80), and from there to Winnemucca, and then on to the Humboldt Ranch, and finally finishing at Lovelock where they would break those horses. I think they called those horses Remounts, but I don’t savvy that word. I read somewhere in my travels a story written by a young lady that went and stayed with the Button family, and I think the place was the Humboldt Ranch. She wrote about how she got off the train and there were trees and hay meadows and how pretty it was. The trees and the buildings are still there, but if there are any meadows, then they are down where you can’t see them from the highway. An old friend of mine, John (Jay) Marden is a history buff, and he lives right there in Winnemucca. We talked on a cell phone about a year ago, and I must not have done anything to anger him as he told me he and his wife would take us to dinner the next time we are in Winnemucca. So, if you have questions about the history of that area call Jay and tell him I recommended you to call him. You never know, it might get very interesting. It was the crack of dawn and the Spanish Ranch wagon, with ten cowboys, was camped at Dry Creek. The boys were done eating, and Kane was the first in the horse corral with his rope. I was second; I liked to catch my horse first as that way I could hobble him on all fours and comb out his mane and tail. I would even hobble my good horses on all fours when I saddled them as that way my hands stayed in practice when flipping and catching the sack hobbles. I always kept my horses cleaned up as I felt that to be a matter of pride amongst cowboys. I knew all those horses, and when a cowboy had a horse that might get a little funny in that cool morning air I would keep an eye on him. One eye on him and one eye on Kane. Even though Kane was the last one out of the corral he was so fast at saddling his horse that you might not be ready when he was. He might give you one minute, and that would be out of the kindness of his heart, but you better not make a habit of it or you were going to hear about it. If a cowboy that had a humpy horse was using his head, he would be mounted up before Kane was and that way he could be talking his horse out of it. Once Kane stepped on he would let his horse walk out for about fifty feet, and then he would hit that mile eating trot that everybody likes to talk about these days. Early in the morning like that it seems as if those mother cows knew what was coming. I could hear them bawling to their calves. Sometimes I would hear the bulls bellering and thundering threats at each other, and once in awhile a coyote would howl. At first we would all be kind of milling around, but when Kane hit the trot we fell into line, and it happened fast. Two wide and five deep. I could hear the sounds of forty hooves pounding the ground and even though we had just started moving out, already the dust was beginning to rise. The morning being cool like it was, some of those horses were snorting and blowing. A humped up horse was looking to make a cowboy rethink his choice of careers. I could hear a cowboy talking--to himself? To his horse? To another cowboy? I never knew. And the spurs, I’ll never forget the jingling and jangling of the spurs as we rode out. Good Lord, but how I miss those early morning rides and the sights and sounds. Martha, bear with me, I haven’t forgotten you. This is getting kind of long so I want you to take a little break. When you come back we’ll get to roping out of that rodash. And Martha, you have no one to blame but yourself, after all, it was you that put the nickel in this jukebox!